Many of the tallits we sell come with thin, machine-spun tzitzit standard (Prima A.A., Sapir, Bareket, Gvanim, Bnei Ohr, Tashbetz) with an option to upgrade to hand-spun tzitzit. Some of our traditional tallitot also come with an option for niputz lishmah, which is a halachic stringency only a select few insist on. We also offer a number of tzitzit tying customs. The most common tzitzit tying custom by far is the standard Ashkenazi tzitzit tying (upper right). If you choose Sephardic tzitzit, we will tie them with single chulyot 7-8-11-13 (and 10-5-6-5 on a tallit katan or by special request). 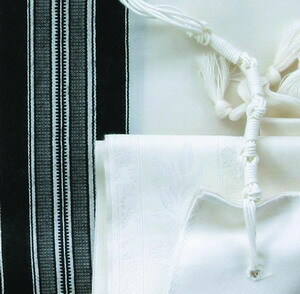 A third option is Yemenite tzitzit, tied according to the Rambam (left). We tie seven chulyot, or 13 by special request for a small added fee. And finally, we can tie according to the Chabad custom. Thick or thin is really a matter of personal aesthetics. In Reform and Conservative congregations, thin tzitzit is the rule. In a traditional Orthodox congregation, thick tzitzit are widespread. We also offer medium thickness tzitzit, which can be hard to find elsewhere.